Recently a friend of mine was talking about the worship song, “Open Up the Heavens”. It’s quite popular (the #27 song in the land this week, according to CCLI). I made a flippant remark about its troublesome theology, which saddened my friend. You see, he likes the song. He finds it encouraging, fun to sing, etc. So, I feel like I have some explaining to do. Mostly to myself, and for my own sake. I would encourage anyone reading this to provide some pushback if you think my critique is out of line. On the other hand, if this exercise causes you to think that maybe, just maybe, we should be more discriminating when it comes to our song selections, I encourage you to join me in these kinds of considerations. We’ve waited for this day (1). We’re gathered in your name, calling out to you (2). Your glory like a fire (3a), awakening desire (3b), will burn our hearts (3c) with truth. 1. We’ve waited for this day. I’m not sure we’ve waited for “this day” if what is meant is the worship service these people are attending. Our eschatological waiting is far grander than that! Not a deal breaker. 2. Calling out to you. Often, I believe we think that worship is something we inaugurate with God through our calls to Him. Worship is a receiving of the grace of God through the means He has prescribed. He calls out to us, not the other way around. Again, not a deal breaker. 3. Fire…desire…burn our hearts.This is SO emblematic of our contemporary worship pursuits. Rather than receiving God through His prescribed means (one another, His Word, His sacraments), we seek some sort of inner “burning”, some sort of elevated emotion, or passion, or desire. In fact, most of our services are measured by whether or not we attain to this kind of “burn”. Funny…I don’t see anything like this in the pages of scripture. In fact, key Reformation leaders saw (and still see) this kind of approach to God as extremely problematic: We center His manifestation within us, rather than embrace His incarnational reality outside of our selves. This is a deal breaker. We cannot and should not be fostering this kind of expectation among our people, as though it is normal or normative. You’re the reason we’re here. You’re the reason we’re singing. Open up the heavens (4). We want to see you (5). Open up the floodgates — a mighty river flowing from your heart (6) filling every part of our praise (7). Yikes. What in the world does this mean? 5. We want to see you. This sentiment confuses and saddens me. It’s a very popular one. Yes, it is a very Biblical concept to “seek the face” of God. It’s also a Biblical maxim that no one can see the face of God and live. My question again: What are we really saying when we sing this? If God did what we’re singing, what would happen? I’m sure 99+% of worshipers have zero expectation of a literal “seeing” of God. So what is it? Some sort of inner vision of God? As someone who embraces the classical, incarnational understanding of the sacraments, I’m thrilled that God has given us material manifestations of His presence. We see Him in water, the wine, the bread. We see Him in the face of one another. I sense that the contemporary Evangelical community, without a robust understanding of how God has already promised to be present with us, is seeking after something else – something neither realistic to obtain, nor promised in the Word. 6. Flowing from Your heart… I could use a chapter and verse for this one. I’m not sure what the river is (the Holy Spirit, like in Ezekiel 37 perhaps?). I don’t want to get hung up on poetic imagery, but I just don’t know what “flowing from God’s heart” means. 7. Filling every part of our praise. Okay, this is where CCM idolatry truly takes hold, and I just don’t think we’re aware of it. We’re asking that the “heavens” will “open”, and that a “river” will flow from God into … our praise?!? Like the prophets of Baal in 1 Kings 18, running around the altar, cutting themselves, crying out to God … it seems to me that our contemporary worship practitioners rehearse up their weekly incantations, lay them out on Sundays, and ask God to come and ignite them – the songs – with some sort of divine additive. Descending like a cloud, You’re standing with us now. No. First, clouds don’t descend. Jesus will descend from the clouds, but He doesn’t descend like a cloud. Second, He doesn’t arrive with us like this weekly, so He can “stand” with us “now”. Again, what are we saying when we say He is “standing with us now”. CONCLUSION: My biggest fear in saying these things is not that people will thoughtfully counter me theologically. Instead, it’s that people will express something like this: “Just relax. It’s not that big a deal, it’s just a song. People like it, and it helps them focus on God. Just let it go.” I’m sure I’ll be the bad guy for wanting to call this out. But our worship is a BIG deal. To God. Spirit and truth. No ear-tickling. The keepers of the deep truths of the faith need to speak up, not dumb down. Souls are being shaped around these worship expressions. The shape is not true. Let’s keep it true. In our look at the “ancient paths” of the people of God, I continue to be struck by the way God has always used very physical means by which to manifest Himself to the world. This modus operandi of God stands in sharp contrast to our modern, “enlightened” expectations of how we think God is obliged to act. In what we historically call the Modern world — the era spawned out of the European Renaissance, fanned into flame by Humanism, metastasizing into what we call the Enlightenment, and bearing the fruit of the scientific revolution — we have become enamored with that which we can measure. Through measurable experimentation we have come to “conclude” that things happen according to what we call “natural laws”. This consistency — this sameness that we find in the created order, we chalk up to being “natural”, and therefore no longer in need of divine impetus or explanation. “If God is going to reveal Himself”, we now say, “it has to be through some sort of super-natural expression.” A burning in the bosom. A miracle. A still, small voice. Still, by modern definitions, none of these things can be counted on as genuine “truth”, because they are immeasurable. Spiritual experience is, by modern definition, doubtful. All this stand in stark contrast to the Biblical testimony of the Apostle Paul, who says in Romans 1:20 , “Since the creation of the world God’s invisible qualities—his eternal power and divine nature—have been clearly seen, being understood from what has been made.” But, because we can measure things, we have become blind to the revelation of God as God, choosing instead to give the glory for created order to Mother Nature, a big bang, or (dare I say) a super-natural capacity for creation to rise above its clearly measurable bent toward entropy and atrophy to evolve through heredity and selection. Okay, back to the River Jordan. I’ve been spell-bound (now there’s a supernatural term for you!) by the stuff-ness of the first chapters of the book of Joshua. Here, we have an estimated two million people who are about to enter the pro mised land near Jericho. Manna is falling daily from the sky. The Ark of the Covenant is in tow. A red piece of cloth is signaling salvation for Rahab and her family. The waters of the flooded Jordan are brought to a standstill when the feet of the Ark-carriers hit the water. God is commanding that stones be gathered and stacked as lasting remembrances. A mass circumcision is performed at God’s urging. Passover is celebrated, including the eating of the prescribed unleavened bread. There is the very real, physical encounter between Joshua and “the commander of the Lord’s army”, where Joshua is told to remove his sandals, because the ground is holy. Then, when it’s time to take Jericho, God specifically calls for marching, the Ark, seven priests, seven ram’s horn trumpets (with a specific prolonged blast), and a prescribed shout. The (by now obvious) point I’m making is this: For Joshua and the Israelites, their ongoing relationship with God was wildly physical. Inescapably tangible. Any notion that one’s spiritual life was relegated to internal feelings or convictions is completely absent from these descriptions. Rather, God unfolds His covenant with His people in ways that “all the peoples of the earth may know that the LORD’s hand is mighty, and so that you may always fear the LORD your God” (Josh. 4:24). Through these tangible means, God says, “Today I have rolled away the disgrace of Egypt from you” (Josh 5:9). They all knew that they were now “crossing the plains of Jericho in the LORD’s presence” (Josh. 4:13). God, present, forgiving, proclaiming … through stuff. Most of us would count scientific progress a great blessing. But the undergirding values of our age which have allowed for great advance have profoundly victimized our faith. They have served to emasculate God in the hearts and minds of the “enlightened”. We now find ourselves the product of a worldview that severs the natural from the divine, honors the former while doubting (and then ignoring) the latter, and is hopelessly preoccupied by our own measuring. With no vision for how the creator makes Himself known to the people of His creation through the stuff of His creation … we have become, not enlightened, but blind. We have “exchanged the truth of God for a lie, worshiping and serving what has been created instead of the Creator” (Rom. 1:25). This is also why we have such a hard time embracing the Ancient Paths of the sacraments. Our modern minds can’t calculate how God could have covenanted with His people through stuff — the water of baptism, the bread and wine of the Eucharist, the Church as His body. Imagine the proto-gnostic of Joshua’s day, saying God isn’t really manifesting himself in physical ways, because “it’s the thought that counts.” That person would stand condemned. Meanwhile, today, especially in Evangelical circles, we reduce our spirituality to mental ascent and inner conviction. In our quest to not worship creation, we have exiled creation from our spiritual lives, and have lost His means for manifesting Himself to us — and to the world. The recovery of the Ancient Paths of the sacraments is so much more than a stray piece of adiaphora. It is human obedience at its core. It is our collective return to all that God is and does. It is fullness of life in the Promised Land. I attend a church now that recites the Lord’s Prayer as part of every Sunday service. It also encourages its recitation in home devotions, both morning and evening. That’s quite a leap from becoming a Christian in a church tradition that never recited this prayer. In fact, that tradition never recited anything. We didn’t even have scripture readings. Everything was spontaneous, except for the more-prepared portions of the sermon. This practice was a bi-product of a strong bias … that written and recited acts of worship aren’t “sincere”. Or “authentic”. Or “genuine”. Only the spontaneous can be “real”. Everything else, because it has taken a preconceived form, if form-al. Because it can be said by rote, one can never know if there’s heart behind the recitation. Interesting. When the disciples asked Jesus to teach them to pray, Jesus did not say, “Just talk to God like He’s your best friend.” He did not say, “Pray whatever is on your heart, as long as it’s what your really feel” (as though your feelings is the barometer of whether or not your prayer is appropriate!). He did not say, “Pray over these types of topics.” He never said anything like these well-worn approaches to prayer we find in our shallow, contemporary spiritualities. He said, “Pray thus.” Then He said words. As Christians, we usually are very cautious about mincing the words of Jesus. But not when it comes to the Lord’s Prayer. We not only can find it dispensable … we often consider these words boring and inadequate. The ancient church did not make this mistake. They recited the Lord’s Prayer. This was central to the liturgy for 1,500 years, and remains central in the expressions of classical Christian traditions today. But, from the outset of Early Modern thinking, the Lord’s Prayer has been trivialized by huge swaths of Christian practitioners. I don’t think what has replaced its use has been anything like an improvement. We should be careful with our words before God. Spontaneous worship acts can get us into big trouble — just ask Nadab and Abihu (Lev. 10:1-2). A concise presentation of well-chosen words is to be preferred — just ask King Solomon (Eccl. 5:2) and Jesus (Matt. 6:7-8). Only pre-written prayers can be prayed in multiple locations at once. In our service book, we have what are called “collects”, from the Latin word collectia, which means “gather people together”. These prayers not only gather the thoughts of everyone within earshot in the service, but also with churches all over the globe. How else could we pray together with our brethren in the global south if we didn’t have written prayers? The Lord’s Prayer is the Word. Your prayers are not. Recitation of the Lord’s Prayer secures our trust, and demands our reverence. Spontaneous prayers can be a crapshoot. Spontaneity is a shallow well. Do you really want your congregation’s dialogue with God to be limited to the off-the-cuff thoughts of your leaders? Isn’t it to our advantage to led in prayer by mature, thoughtful saints, from both the past and present? If you’re going to have spontaneous prayer, it had better be done by people with deep doctrinal equipping who know what they should be praying and how. Spontaneity is no more “genuine” than thoughtfully selected written phrases. For years I have endured “spontaneous” prayers in church that are nothing but the same drivel that has been prayed a thousand times before. Often it’s an auto-pilot prayer which has as it’s only priority providing enough time in the service for the band to get off the platform. Spontaneous praying makes it hard for people to pray. Do you ever bow your head, and wonder what you should say? Especially when you’re asked to pray out loud, in a group? Written prayers free up those who aren’t so glib to enter into solid seasons of prayer without the pressure of coming up with good stuff. This may be a key reason why there isn’t much actual prayer in most contemporary church services. My prayer for all of us is that we would be liberated from the cul-de-sac of our limited minds, and be freed to embrace the rich tradition of our church’s prayer life that is stored for us through literature. Jesus’ prayer is indispensable. So are the Psalms. May the Word, and those God has given to us to be its pastors and teachers, give thoughtful shape to our ongoing conversation with God. Over 3,300 years ago, the Israelite prophet Moses was called to the presence of God on Mount Sinai. It was there that God spoke the words we now refer to as “The Ten Commandments”. In May of 1964, the Fraternal Order of Eagles, in partnership with Hollywood movie director Cecil B. DeMille, gifted the state of Arizona with a monument depicting the Ten Commandments. It was placed in Wesley Bolin Plaza, just east of the Arizona State Capitol. In 2003, the memorial became the target of an attempt by the American Civil Liberties Union to have it removed. They argued that it violated the concept of separation of church and state. They didn’t succeed, but the controversy surrounding the inclusion of something so religious on government grounds continues. Why the secular world disapproves of the Ten Commandments. Duh. Though three out of four North Americans still believe in God, there is significant doubt that the God of the Jews is the one true God. There is also doubt about a) the historicity of the Sinai event, b) the credibility of the Bible that contains the Sinai story, and c) the relevance of the Old Testament of the Bible to the New Testament practice of Christians. Perhaps more to the point: Americans, in general, don’t like others telling them what to do. Particularly ancient religious guys like Moses. We don’t have the Code of Hammurabi, the Analects of Confucius or the Koran in Wesley Bolin Plaza … so why the Ten Commandments? Though I disagree with the assessment that the Decalogue monument is some sort of violation of anybody’s liberties, it is a bit odd to have them there. But, in the church? Should they be prominent there? The Order of Eagles and DeMille felt like the U.S. was slipping away from its Biblical moorings. They were right, and the slippage continues. They wanted to see Biblical content remain central to American life. This reality, too, is fading. In our church, the Ten Commandments are an ancient path that is a critical part of our teaching and practice. Well, it’s a big part of what we call our Catechism, which is taught to our young teens in our Confirmation programs. We continue to believe that the Ten Commandments are part of scriptural revelation from God, and we read the Exodus and Deuteronomy passages when they come up in the cycle of public readings. But many Christians who have practiced their faith for years are unable to list these ten commandments for memory. Many haven’t read them for themselves in years. It’s not enough that the Ten Commandments be conveniently memorialized in our Catechisms. They are an ancient path that needs to be hiked regularly for the good of our souls. How might we do that? More tomorrow … from the pen of Martin Luther. 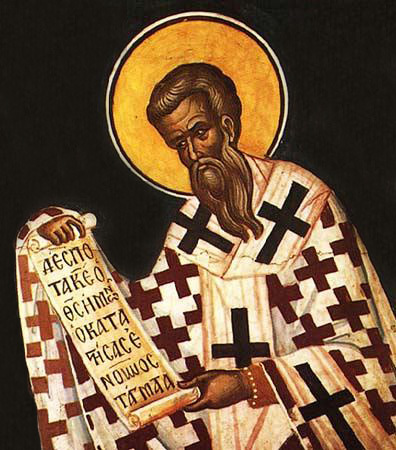 Of the three creeds that are acknowledged by all of the ancient western Christian traditions*, the Athanasian Creed is known and used the least. It may be because it’s longer. But really it has a lot to do with its content. Much of its purpose is an attempt to hammer down and make explicit one key point: the equality, unity and distinctness of the three persons of the Trinity – Father, Son and Holy Spirit. Maybe one of the reasons that this creed doesn’t resonate as strongly as the others is that … well, it’s not that convincing to the human intellect. “For my thoughts are not your thoughts, and your ways are not my ways.” This is the Lord’s declaration. “For as heaven is higher than earth, so my ways are higher than your ways, and my thoughts than your thoughts” (Is. 55:8-9). We, of course, try to understand the thoughts and ways of God. Though there is an infinite separation between God’s truths and our ability to understand them (“as heaven is higher than the earth“), we are still encouraged to seek the face of God (Ps. 105:4, 27:8). The Apostle Paul says that, “For now, we see only a reflection as in a mirror, but then face to face. Now I know in part, but then I will know fully, as I am fully known” (1 Cor. 13:12). All we can know about God is what has been revealed. Thankfully, God has gone to great lengths to let us know what we can know. As Jesus told His disciples on that Maundy Thursday evening, “I will ask the Father, and he will give you an advocate to help you and be with you forever—the Spirit of truth … He lives with you and will be in you … I no longer call you servants, because a servant does not know his master’s business. Instead, I have called you friends, for everything that I learned from my Father I have made known to you … when he, the Spirit of truth, comes, he will guide you into all the truth” (from John 14-16). So, “all truth” is ours … that is, all the truth that we both need, and can handle. But ultimately, the fullness of truth about God is beyond our grasp. That’s why descriptions about God can be so unsettling, and less than “convincing”. You can say it over and over again (as does the Athanasian Creed), but it doesn’t become more convincing through repetition. “We worship one God in Trinity, and Trinity in Unity; Neither confounding the Persons; nor dividing the Essence. For there is one Person of the Father; another of the Son; and another of the Holy Ghost. But the Godhead of the Father, of the Son, and of the Holy Ghost, is all one.” Like a bad cowlick, no amount of hair gel can pin this down. Three just isn’t one. And different just isn’t the same. Herein lies the huge point for all of us as we pilgrimage down the ancient path. Ours is a journey of belief, not all-knowing; faith, not sight; revelation, not exploration. Many theological traditions, especially since the days of the Reformation, have prided themselves in their exhaustive studies of the scriptures, and their incessant attempts to pin down the cowlick of the mystery of God. Rather than taking Biblical revelation and believing it, they take the revelations collectively, and “try to make sense” of it. They end up with theological systems that say things that the scriptures don’t, claiming all the while that their thinking must be true – given what we know in revelation, compounded by our own brilliance that now makes it understandable. Read the Athanasian Creed. Read it regularly. When it warms your heart, rejoice. When it bugs you, believe! It’s at those moments we are obliged to bend the knee to a God Who is much bigger, better and more brilliant than we. It is good to think thus. * The Athanasian Creed is historically endorsed by the Lutherans, Anglicans, Reformed Churches, and Roman Catholics. Specifically, there was debate about the person of Jesus. The Apostle’s Creed had made statements about the historical person of Jesus: His conception, passion, crucifixion, ascension and return. It told us what He did, but didn’t tell us Who He was. A debate raged over whether Jesus was, in fact, God in the flesh. One group, whose chief spokesman was a winsome, brilliant pastor from Egypt named Arius, believed that Jesus was subordinate to the Father, and therefore less than God (called Arians, and Arianism). On the other side were those who believed that Jesus was wholly God – as God as the Father is God. Each side turned to the Bible for their proofs. Both had articulate spokesmen. Heels were dug in deeply. You might ask, “why don’t they just let each other believe what they want?” But it’s not that easy. They certainly couldn’t worship together, because they couldn’t ascribe to Jesus the same things. Beyond that, if Jesus is less than God, it’s blasphemy to call Him fully God. But, if Jesus is fully God, it’s blasphemy to say He’s not! Both sides saw the other as not only a different opinion, but a heresy. Meanwhile, Constantine had become the Emperor of the Roman Empire, and had chosen to see Christianity tolerated in His realm. He saw the value in the people being united by a shared faith – but quickly learned that the Christians were not united among themselves. He decided to get the Arianism issue resolved. So it was Constantine who called for the Council of Nicaea in 325 AD, only eight months after becoming the sole Roman Emperor (this was obviously a high priority item in his administration!). It’s a shame the church couldn’t get it together on its own, but we can still be glad that the government forced the church to make important conclusions about what it believes. Jesus is begotten of the Father, but “eternally begotten” – in other words, there was never a time when Jesus was not. He is eternal. Like God (because He is God). This begetting does not make Jesus less than the Father. Rather, Jesus is God (from God), true God (from true God), very God (from very God). God! The Father and Jesus constitute a single “being”, a single “substance”. Jesus is as God as the Father is God. Both the Father and Jesus were behind the creation of all things. Again, this was to affirm that Jesus was in no way less than God. The Holy Spirit is also God: “Lord”, “giver of life”, and to be worshiped and glorified (which only God should receive). YES!!!!! As the early church father Gregory of Nazianzus (329-390 AD) famously said in the days after the formulation of the Nicene Creed, “What is not assumed, is not redeemed.” In short, Jesus had to be God, because only God can redeem man. And Jesus had to be man in order to be the “first-born from the dead” (Rom. 8:29; 1 Cor. 15:20; Col. 1:18; Rev. 1:4). Creator had to become creation to save creation, but had to remain God to remain the perfect sacrifice. As soon as you say Jesus is less than God, his sacrifice for our sin isn’t enough. As soon as you say Jesus is less than man, then He no longer represents us … He is no longer the “second Adam” (Rom. 5:12-19, 1 Cor. 15:45), but is some sort of hybrid human. Jesus saves what He becomes while remaining Who He is. Otherwise, all is lost. So, despite the good, hard work done in Nicaea 1,693 years ago, the battle over the truth of Who Jesus was and is rages on. In our Lutheran tradition, on every Communion Sunday, we proclaim the Nicene Creed, anchoring our souls to this indispensable, pivotal, redeeming truth. God became man – my only hope of being reconciled to God! A few words about the Athanasian Creed, coming soon.